Oh look: there she is on Fox News. Says it all really. as far as newspapers are concerned. This sort of proves my point. If you aren't British - and even if you are - never try to use the Daily Mail to win an argument. 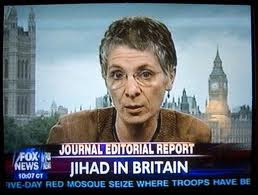 As a case in point I give you the redoubtable Melanie Phillips, "journalist", from yesterday's edition I find this intersting, not so much because of her editorial style which is as predictable as ever, but because, judging by the on-line comments, she really missed the public mood. When the readers of the Daily Fail turn on a neo-con "journalist" in this way, the end of the world (at least as we know it) must be nigh. So, Sir, will you be part of the jihad on Thursday? I say go for it. Oh yes! The school is shut despite Pob's bullying e-mail to the Boss. I shall be demonstrating. Some of us in another profession have had our pension qualifying periods altered along with extended working years ... and we don't have any opportunity to strike/demonstrate. I find my sympathies for this present broo-haha somewhat jaded. I shall also be going in to our local Primary in a few minutes to do my regular stint of listening to youngsters read. So you've had a rough time which makes you unsympathetic to others having a rough time? How exactly does that work? Surely we should all be protesting to make sure that people like you get a better deal. We can't do that if government have stuffed us all to badly paraphrase Niemoller.